We are absolutely fabric to the universe and the universe is fabric to us. The length, the depth, the breadth of everything that has ever existed, exists right now and will ever exist. So that’s what I’m hoping the audience will get out of my work. This sense of actually belonging in this bigness. 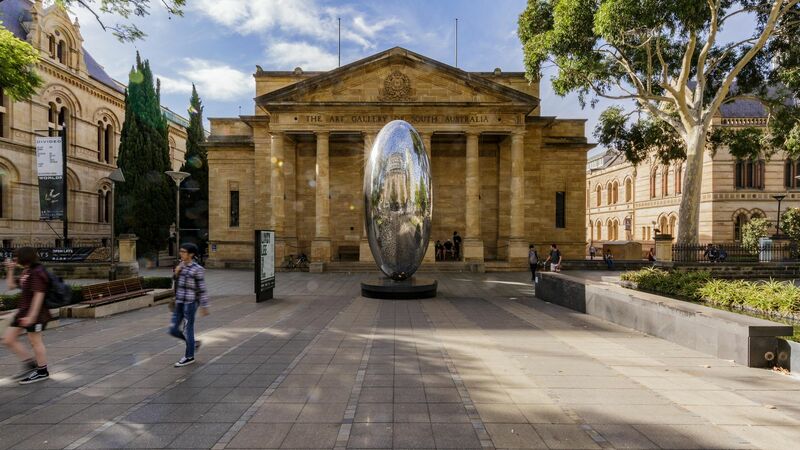 Situated at the entrance of the Art Gallery of South Australia, Lindy Lee’s six-metre sculpture The Life of Stars links the Art Gallery of South Australia and its exterior forecourt. Fabricated by Lee in China, the work displays a densely perforated surface and creates dappled light, which together suggest a universe within, while its oval form suggests the beginnings of life itself. Visible by day and night, The Life of Stars appears both to contain and radiate light. This delicate play between interior and exterior, form and emptiness is significant. The concentric circles on the surface reference Indra’s net, which is a metaphor of Mahayana Buddhism, symbolising the universe as a vast web of connections. The Life of Stars was presented as part of the 2018 Adelaide Biennial of Australian Art: Divided Worlds.